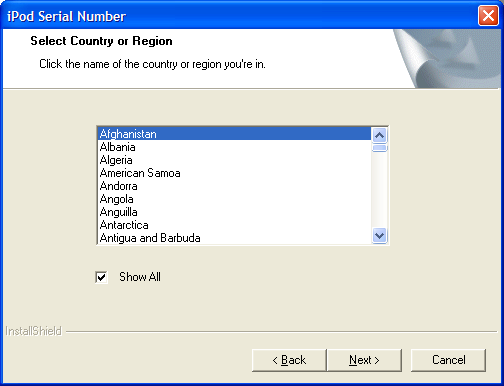 Here is an example of a smart country selector. From installation of an Ipod Nano. The usability principle is called progressive disclosure: First, display the most typical settings, then give the ability to show all in the special cases. Progressive disclosure: Don’t clutter screen with options that only matter to few people. Background info on progressive disclosure from Wikipedia, Usability first, UI Patterns, Macromedia, Microsoft. More on form usability: I’m looking for more examples of form usability, please give suggestions and screenshots if you have any ideas. 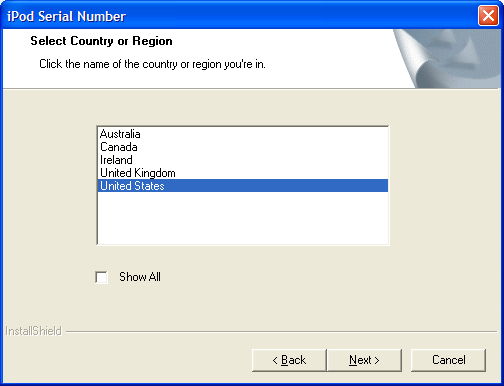 This entry was posted by Jesper Rønn-Jensen	on Thursday, June 22nd, 2006 at 13:16 (GMT-1)	and is filed under Forms, Usability, User Interface. You can follow any responses to this entry through the RSS 2.0 feed. Both comments and pings are currently closed.